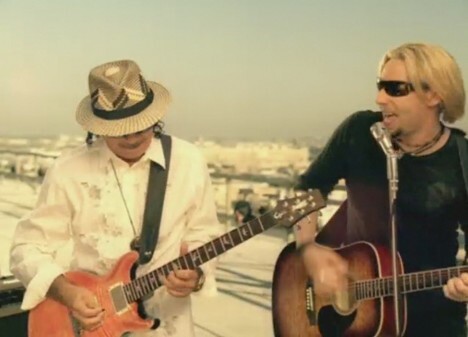 Chad Kroeger, lead singer and lead guitarist for the rock band Nickelback, has collaborated with guitarist Santana to produce a music video for Into The Night. The video shows a man (Freddy Rodriguez) about to jump off a building inspired to stay alive by a beautiful woman (Dania Rodriguez) in the apartment building next door. Filming was shot by director Jessy Terrero via Terrero Films. Editor was Nabil Mechi at Murex Edit.